Nigel was a puppy mill dog who had never walked on grass, had never climbed stairs and had missed the joys of puppyhood. His ultimate rescue was heart wrenching; he and some other “disposable” dogs had their feet bound with duct tape and were going to be drowned when the rescuers entered the facility. Home is a special place for Nigel. His listing on Petfinder had pulled at Marla Collins’ heartstrings, but she didn’t think there was much hope of her adopting him. 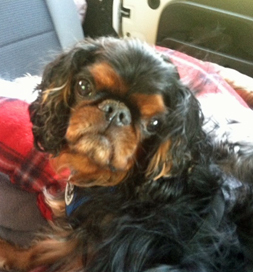 She was looking for a companion for her Shih Tzu, Belle, but Nigel was in Ohio, and she was in Massachusetts. Nevertheless, she made an enquiry. Emails began to fly back and forth until the founder of the rescue group was convinced that this would be a good placement. As it turned out, the rescuer was making a trip east, so she put Nigel in a harness in her back seat and drove him right to Marla’s house, all the while knowing that the actual meeting would provide the final decision. “She put Nigel down on the grass, and I squatted down to meet him,” Marla says. “He immediately came over to me and put both front paws on my legs as if he knew me from way back.” This was from a dog that was extremely timid. Belle, Marla says, “taught Nigel to be a ‘real dog’ faster than I ever could have.” They have become best friends. She admits it hasn’t always been easy, but Nigel’s love and faithfulness have far outweighed any problems.